CALGARY -- Jarome Iginla has had a few nicknames over the course of his hockey career. Iginla became the 42nd player in NHL history to reach 500 goals when his centering pass hit a pair of Minnesota defenders and careened into the back of the net in Calgary's 3-1 victory against the Wild at the Scotiabank Saddledome on Saturday night. "It's something I've been very blessed in hockey to have some great moments and memories that will stick with me," Iginla said. "I've been part of different games and scoring some goals but that's one that I'll remember. When you start out you don't really think, 'get to 500' or whatever, you just play. Along the way you just keep going. I definitely have to pinch myself. You don't stop too often to look at things." The accomplishment wasn't lost on former teammate Craig Conroy, who holds the record for most Iginla assists with 85. "Just 500, it's hard to imagine," said Conroy, now the Special Assistant to Flames GM Jay Feaster. "Even if you have 10 50-goal seasons, that's amazing. You've got to figure it's going to be a long time before the next guy does it. Maybe people will appreciate it more. They say, ‘oh, 500 goals'. It doesn't sound like a large number, but …"
Iginla is only the third active player -- Jaromir Jagr and Teemu Selanne are the others -- with 500 goals. Just 15 players scored their first 500 with one team and only eight have scored all their goals with one franchise. Joining such an elite club isn't about to change the modest Iginla, Conroy said. "That's the thing, he's so humble," Conroy said. "He takes everything in stride. To be the 42nd person ever to do it in the NHL is amazing. He's still the same person the first day he walked into this room to right now, and that's what makes him so special." 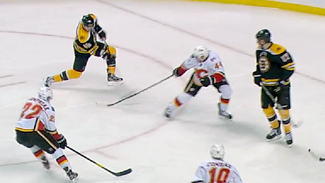 Neither Conroy nor Iginla were sure when or where No. 500 would come. After scoring No. 499 in the first period on New Year's Day in Nashville, Iginla had nearly three full road games to get the historic goal. Instead, he went scoreless before accomplishing the feat in front of family, friends and teammates. "It's special to do it at home," Iginla said. "It feels really good. Calgary fans have been very good to me over the years and good to us as a team. It was a great atmosphere tonight and it was pretty neat. You don't even know how to react." The milestone goal wasn't very artistic -- his pass caromed off two Minnesota players and slid past a helpless Niklas Backstrom. "I've probably scored a number of ugly ones or ones on good bounces, and that was definitely one of them," he said. Center Brendan Morrison, forced to watch from the press box after suffering an upper-body injury, couldn't flood the ice with his teammates in celebration of Iginla's feat. Regardless, he knew the goal was meant to come on home ice. "It's phenomenal," Morrison said. "It's almost like it was meant to be back at the Saddledome where he's been his whole career in front of his fans, his friends, his family, his kids." It was hard for Iginla to disagree. "In a perfect world, it feels more special to do it here at home," Iginla said. "It was a good energy in here." The normally verbose Conroy struggled to put into words what it meant for Iginla to capture the moment in Calgary. "That's the nice thing, it was just destiny," Conroy said. Much like his first career NHL goal -- which came in his first NHL regular-season game on Oct. 5, 1996. And much like his 500th, Iginla will always be quick to recount his first. "You never forget your first, that's for sure," Iginla said. "Every player remembers their first goal. Mine was in Vancouver on Kirk McLean and I got a pass from Corey Millen. It was a 2-on-1 and I was driving to the far post and he gave me a tap-in. It was pretty exciting. You want to score your first goal very badly and experience that feeling and you don't know when it will come." It was the same feeling Iginla had for No. 500. But after taking a little time to enjoy it, he'll put the achievement behind him and get back to the task at hand – getting the Flames back into the top eight in the Western Conference. "You stop and try to take a second and enjoy it," Iginla said. "It's also something more for when I'm done. It's a little pause and enjoy it for a little bit. "(But) it's a new day tomorrow. You've got to go. I want to play more games and score more goals."